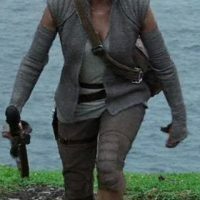 Rey was a human female scavenger who discovered her latent Force-sensitivity while on a quest to find the legendary Jedi Master Luke Skywalker and bring a new hope to a galaxy on the brink of war. 1. Staff: The staff should be proportional to the costumer’s height. It should be about 6-8” (15.24 cm to 20.32cm) above the head of the costumer when held straight up. Staff has a dark brown or black strap attached with rusted buckles. Staff is extremely detailed and will be compared to the photo references to determine closeness in detailing for approval. Staff is weathered. 2. Crossbody satchel: The satchel is an olive green weathered canvas with a matching weathered shoulder strap. It should be worn crossbody.